Posted on 1/21/2019, 1:08 pm, by kittykill, under Meatless Monday. Winter is the perfect season for a party. It doesn’t matter if it is big game day, an award show or movie night; the viewing is always better with friends. Share the good times, and good food, with MareMare’s recipe for Cauliflower Spinach Puree. This dish is a tasty alternative to the normal spinach dip. Add peppers to spice it up or artichoke hearts for a more traditional dip. 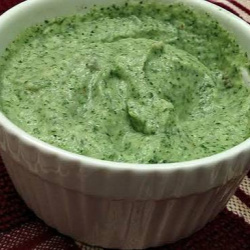 Cauliflower Spinach Puree also packs a punch as a side dish alternative to mashed potatoes. Melt smokey cheese over the top for a truly decadent treat. No matter how you serve it, this dish is versatile and easy to make. Cauliflower Spinach Puree for the win! Chips, dips and sauces; we have them all on our fabulous Cooking Board! Put your own spin on a traditional recipe. Have a tasty Monday!